WhatsApp update is going to completely change the way the backup is backed up. Where we first had to resort to Google Drive to back up WhatsApp. At the same time, there will be no need to consume Google Drive for this. There is a deal between Facebook and Google, the parent company of WhatsApp, in which users can get the WhatsApp Backup in their personal account free of charge. According to an agreement between WhatsApp and Google, the back-up of WhatsApp will not take the space of Google Cloud Storage from November 12. After this, all types of data including Whatsapp media, text and memos will ban e automatic backup on the Google Account. With the updating of What's App in November, all old WhatsApp backups (photos, videos, chats), which have not been updated for the year, will be deleted. So before the 12th of November, make sure that you have backed up your data. Backup users are advised to connect the phone to WIFI while backing up the users because the backup files are in size and consume data so that you can take extra data. How to take chat backup? 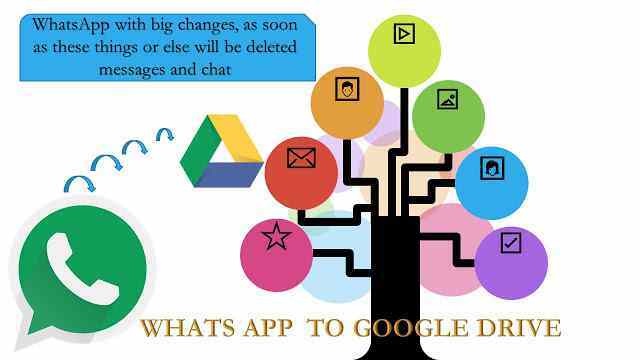 First Activate your phone Google Account and then install Google Drive Setup in it. After that go to the dot on the side of the Whatsapp, you will open the menu. After that go to Settings. In this go to Chat and select Backup Chat.